Cyberbullying is no joke. Kellyn Bechtold can tell you that firsthand. The latest Survivor: Ghost Island castoff said she has been getting disgusting hate from social media trolls, including somebody who wished she would get cancer. Now, Kellyn is expressing her desire to be an advocate for young people who are victims of keyboard brutality. But that’s not all we discussed in our one-on-one interview. 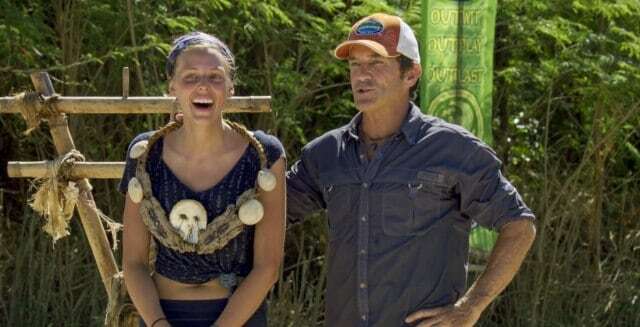 Kellyn also promised an incredible finale with a tough jury that grills the final three castaways into truly proving why they are the most deserving winner. SheKnows: Going into that Tribal Council, you expressed concern that the votes were going to fall against you. Was it just you being paranoid, or did you know your elimination was coming? Kellyn Bechtold: It doesn’t make great television, but I knew it was me. You don’t see much of our relationship, but Sebastian and I were super close. He came to me and paid his respects. Wendell had, too, and said, “Kellyn, I love you unconditionally, but it’s 75 percent sure you’re going home tonight.” I thought if he was telling me he loves me and he’s 75 percent sure, that was really 100 percent sure. They had done the honors of letting me know. Donathan gave it his best shot at getting things to be emotional. He came to me before Tribal and was like, “I’m so mad.” I was like, “You aren’t going with them? Let’s vote Dom. He hasn’t had any votes toward him. Let’s make him feel what it feels like to have his name come out of the urn.” I was emotionally caught up in Donathan’s emotions at that point. In the middle of Tribal, they were outwardly talking about splitting the votes. I figured out, instead of wasting my emotional vote on Dom, I voted for Donathan to cause a tie. It was really fun. I knew I was on my way out, but I had this little golden sparkle in my eye that I was going to make them at least sweat it for a minute. That’s how it went down from my perspective. Maybe the boys were going back and forth on whether or not they should get Donathan out or me. From my perspective, they told me it was my time. It was what it was. SK: From a viewer’s perspective, Domenick and Wendell appear to be controlling almost everything. How are these guys surviving all the votes? KB: I don’t know. I know why I didn’t pull the trigger at 10. I had done a lot of work pre-merge to vote out the Malolos. I thought they [Dom and Wendell] were a shield for me because they were bigger threats. … At the point we have eight people, we can do this [vote them out]. I really thought it was in Laurel and Donathan’s best interest to come with us girls, but they had a lot more days with Dom and Wendell on the island. I didn’t meet them until the merge. I didn’t have as many days to build a relationship. Relationships are a big deal. Laurel trusted them, and she trusted them more than me. As much as I wanted to say, “Hey, girl, you voted for me and I voted for you because these boys are bossing us around. Let’s work together and get them out,” it just wasn’t the story she wanted to follow. Those boys had a lot of ammunition. I kept saying I brought a knife to the gunfight after the merge. They frankly outplayed me so hard. They got to the goat first. SK: Has there been any dissension or distrust between Domenick and Wendell? KB: Zero. They were open about it to me. I knew nothing was going to happen unless Dom or Wendell were willing to make it happen. They had Laurel, Donathan and Sebastian in their pocket. My last three days, I was trying to sit down with Dom first and say, “These are all the reasons you cannot beat Wendell in the end. You should sure as hell start making a move because he’s gonna beat you.” That wasn’t working. Dom was like, “There’s no way he’s gonna beat me.” I was like, “Fine. I’ll go to Wendell.” I went to him for about an hour, breaking down who each person would vote for. “You can’t beat Dom in the end.” I thought there was more wiggle room between Dom and Wendell than there was between Wendell and Laurel. But they were not going to budge. They both looked me in the face and said, “You’re wrong. We have to go together. If one of us goes, the other is next.” From my perspective, on day 35 they were tight as glue. I can’t wait to see what happens and see if they decide to stick with that or not. SK: Who did you want to go to the end of the game with? KB: Originally I wanted to go with Angela and Chelsea. After Chelsea was gone, I still wanted to take Angela. Honestly, people can make fun of me for this, but I thought I could beat anyone except Dom and Wendell. I was willing to go with Laurel and Donathan if they were going to pull me in. I had been working with Sebastian all game. He and I were really great friends; he just happened to want to work with the men. I would’ve taken Sebastian, but I was a little nervous about the likability factor that he could beat me. I was really willing to go with any combo except Dom or Wendell. If I had to take one of them to the end, I probably would’ve been willing to go with Dom, but I didn’t trust him. He and I were never on the same page. We were working together out of convenience, never out of alliance. SK: Let’s talk about Angela. Other contestants already voted out this season have said she’s oblivious to the game that’s being played around her. What’s your take on Angela? KB: She was left out of that first Chris vote because she was working with him and people couldn’t really trust her. She just kept getting left out of votes, and that was really intentional. None of us really knew where she stood 100 percent, and so we didn’t necessarily trust to tell her what was going on. Personally, she’s tough as nails, she’s an amazing person and a smart woman who served her country. I adore her, but she was not being outwardly strategic. She was always talking to me about what we were going to do, but she was kind of along for the ride in a very tough way. SK: What kind of feedback are you getting on social media from viewers? KB: [Laughs.] It’s been very mixed. Many people reach out to tell me that they have courage now to make moves in their lives that they didn’t have courage to before. Women have reached out to me about being in tough relationships. That part is amazing. Other people have reached out and told me they hope I get cancer, they hope I die. There’s a lot of extremes. It’s been a really interesting exercise in owning who I am in my own story. It really doesn’t matter what people think about me. I feel bad for young kids these days who deal with cyberbullying and all that stuff. I really would love to be an advocate for young kids who have to deal with hate online. It’s just something that’s really unnecessary in the world. I can handle it. I’m a 31-year-old woman. I have no apologies for who I am. I am proud to be a wild woman who doesn’t sit in the corner and keep her mouth shut. People can say whatever they want, but I want to encourage people to try and keep their hate to themselves. Not everyone is a 31-year-old woman with her own life to live. I feel like a mother bear. Come at me if you want to, say bad things about me, but when I see them talking about my other Ghost Islanders, that’s what really gets to me. For the most part, it’s been a wonderful as family and strangers have sent thank-you cards and told me I inspired them. Overwhelmingly, it’s been wonderful. SK: That’s intense, to think people would wish cancer on you for being on a TV show. KB: Just to think about a human being in their home and feeling that upset and sad that they would reach out and type those hateful things. I just feel really bad for people that are that unhappy. It’s a dark place they’re in. I’m more concerned for people. I hope for anyone who feels that way. I still care for them. I really hope they can find light and love in their life. SK: Give us a tease to finale night. What can we expect? KB: Oh, my gosh! It’s going to be amazing! If you all think I’m going to go over there and sit on the jury and not blow things up, you’re wrong. I’m pretty proud of the questioning and lawyer vibes that I put in final jury. We didn’t let anyone off the hook easily. If anything, you’ve got to tune in and see how the final three are called to the bench and they have to stand up for their game. It is exciting. I loved it. It was amazing. To me, it’s one of the times where people have been drilled the hardest for actually proving their game. Tune in and find out. It’s going to be a wild ride. I think the jury is coming in hot, as they say [laughs]. KB: I turned my video to selfie, pressed record and talked for three minutes. I didn’t want to use editing software or anything like that. I auditioned twice, back-to-back years. The first time I sent in a video, I was asked to fill out an application but I didn’t hear anything. A year later, obviously my life had changed a lot. I had been married and divorced in that year, and that’s the “fun” story to pick up on. I think they were intrigued by this idea of a strong female character trying to build her own new life for herself. I was just myself. If anybody wants to be on the show, literally all you have to do with today’s technology is press record in selfie video, talk to the camera, tell them who you are, why you want to play Survivor and just go for it. The fact is, you will never be on the show if you never apply. I encourage anyone who has any inkling to do it, to go ahead and press record. 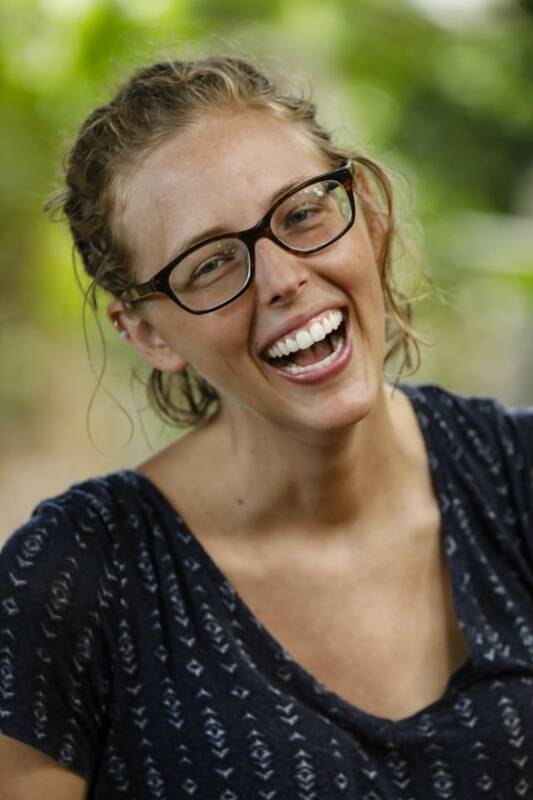 Do you think Kellyn deserves a second chance at playing the game again? Join the conversation now by leaving a comment below.